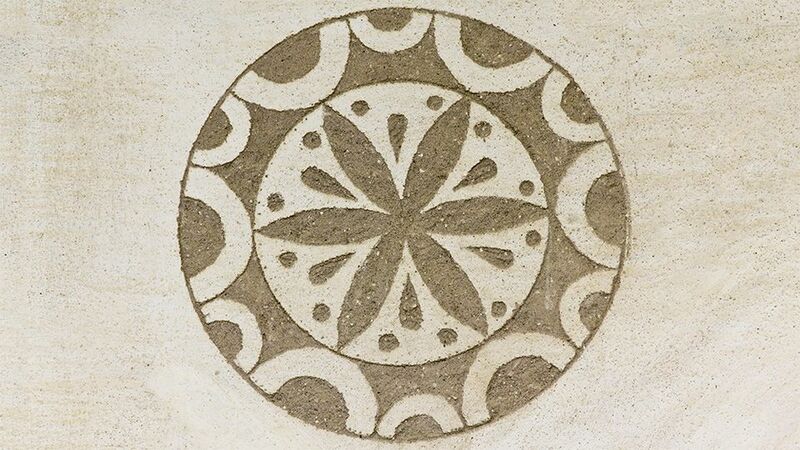 Sgraffito is defined as ‘decoration by cutting away parts of a surface layer to expose a different colored ground.’ It has been seeing a bit of a welcome renaissance recently and is a currently popular (and relatively easy) technique to use in your work. Sgraffito is done on leather hard pottery, as the top layer is much easier to scratch off. In essence, you scratch through a colored slip to reveal the clay body beneath. Where did sgraffito originate from and what is its history? Given that the word sgraffito is derived from the Italian word graffiare meaning ‘to scratch,’ the technique did indeed begin in Italy and dates back to around the 15th or 16th century. Sgraffito played an important part in Rome during the Renaissance period and was frequently used by famous artist Caravaggio and his partner Maturino da Firenze. Both of the artists were contemporaries of Raphael (one of the painting masters alongside Michelangelo and Leonardo da Vinci) and part of his workshop. The artists first started using sgraffito on the exterior of buildings, using it to create incredibly detailed frescos on housing and palace facades. Incredible examples of the sgraffito technique remain across Italy, particularly in Florence and Pisa. After its introduction in Italy, artists used it across Europe and traces of it can be still be seen everywhere from Bavaria to Transylvania and widely in Catalonia. Sgraffito then moved from the master renaissance painters and builders to be used in other areas, for example on ornate picture frames, scratching into gold leaf below, and of course, ceramics. Some of the earliest sgraffito ceramic ware was produced in the Po Valley in Northern Italy and later Pisa, where it began to be traded across Europe. Sgraffito was also very popular in the Middle East, notably Iran, who developed some of their types of sgraffito. The Amol region used elaborate birds and animals in their designs; Gabri Ware was developed carving floral designs through a thick white slip, and Aghkand Ware used similar iconic bird designs using green and yellow coloring. So the first place to start with sgraffito is choosing which clay to make your piece from. As a basic rule, fine clays work much better, as anything rough or with too much grog in won’t create a smooth finish when you’re scratching off the topcoat of slip or underglaze. You can, of course, use the sgraffito technique on any shape or size of pot you wish, but for your first time a large flat dish, plate or tile will be easiest to work with. Once you have done your work, you’ll need to let it dry to leather hard, as it will be much easier to carve and your lines will be more defined. Then you’ll need to use a slip, engobe (a fritted slip with a lower clay content) or an underglaze. You can use any color you like, but black can work especially well as the lines are so crisp. The next step is to paint on your underglaze, around five coats of evenly applied underglaze should work well, then leave it to dry to leather hard. Then for the creative part in choosing what design you want to use. There are a couple of different techniques you can choose from. Firstly you can use a pencil (something light like a 2B pencil) to put your design onto the piece, or you can scratch freehand into the clay. Secondly, if your design is a little more on the elaborate side, you can draw it first onto tracing paper. Then simply put the tracing paper onto your work, and carefully copy the design onto your plate. A good tip is to use a colored pencil to copy from the tracing paper, so you can see exactly which lines you have already traced. Once you have made your initial lines on the plate, it’s time to start carving. A sharp metal tool with a point (you can even use wood carving tools) is best for scraping off the underglaze. Follow the design you have made on the piece, gently scratching it off using a medium pressure as you go. It’s a long process, depending on how detailed your design is, but very therapeutic. Have a soft brush to hand to keep carefully sweeping off any shavings. Once finished your piece is ready for firing, and the results can be very exciting.